This outings program takes us to a training exercise of the Bay Area Mountain Rescue Unit (BAMRU). 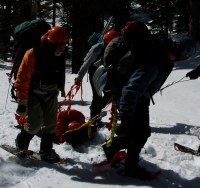 The rescuers practice their winter alpine rescue skills in the Carson Pass area, just south of Lake Tahoe, California. Most search and rescue teams in the U.S. are all-volunteer. BAMRU is just one example. To find out about the mountain rescue teams near you, you can look at the Mountain Rescue Association (MRA). In next week's show, we'll talk more to John Chang of BAMRU and Tim Kovacs of MRA about how you can get involved and volunteer for mountain and wilderness rescues. Steve gives a history of telemark skiing. He talks to a couple of people about their experience at the festival, visits some of the events at the show, and attends a lesson. There's a history of telemark skiing on the site, TelemarkTips.com. They also have an online "lesson" and many other articles about getting started. There's a magazine devoted to Telemark skiing. Telemark skiing gear and technique is also frequently covered in the backcountry skiing magazine Couloir. This outings program is an interview with Tim Bui, the founder of the online social network for outdoors activities called, The Outdoors Club. Long before the current craze of web sites called social networks, the web site outdoorsclub.org was connecting climbers, hikers, and other wilderness travelers. There's a wide range of outdoor activities in their calendar, from beginner classes to major expeditions, and they were doing it back when final vowels were still in fashion. This outings program takes us to California's first state park, Big Basin Redwoods. 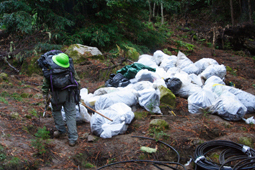 We explore the problems caused by a five-acre marijuana plantation hidden in the park's backcountry, and follow the volunteer group who provided considerable labor to clean it up. Marijuana cultivation is a growing problem in public lands, especially in the Pacific west. Marijuana demand is increasing, our borders are tightening, and budgets for managing our public lands are being cut. National Parks, National Forests, and State Parks are increasingly attractive to organized crime for use as cultivation sites. You can help in two ways: 1) By refusing to fund the black market for marijuana production, and 2) by volunteering for or donating to volunteer organizations who provide labor to restore these damaged ecosystems. This outings show is our first Vox Pop. 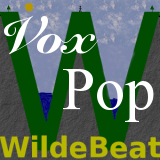 Does the average person value getting into the wilderness? Steve recorded the candid thoughts of these hikers on the Pine Ridge Trail, in the Big Sur River Canyon of California's Ventana Wilderness. They hiked ten miles each way to visit the popular hot springs at Sykes Camp. 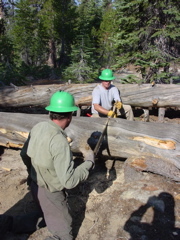 This outings program is a work day with the High Sierra Volunteer Trail Crew, in the Jennie Lakes Wilderness of the Sequoia National Forest. Why join a trail crew? For the feeling of making a difference, to be with more experienced outdoors men and women, to spend time in the wilderness, for the fun and camaraderie, or perhaps just for the food! This outings program is a report from the October 1 - 3, 2004 gathering of the American Long Distance Hiking Association West, or ALDHA-West.